It’s the fifth time the league has held the event, which happens every other year. Michael Berry, pitcher and second baseman for the Philadelphia Athletics Base Ball Club shows off a lemon peel ball, which is what players used back in the day. The seems feature an “X” pattern, unlike the typical horseshoe pattern of today’s baseballs. 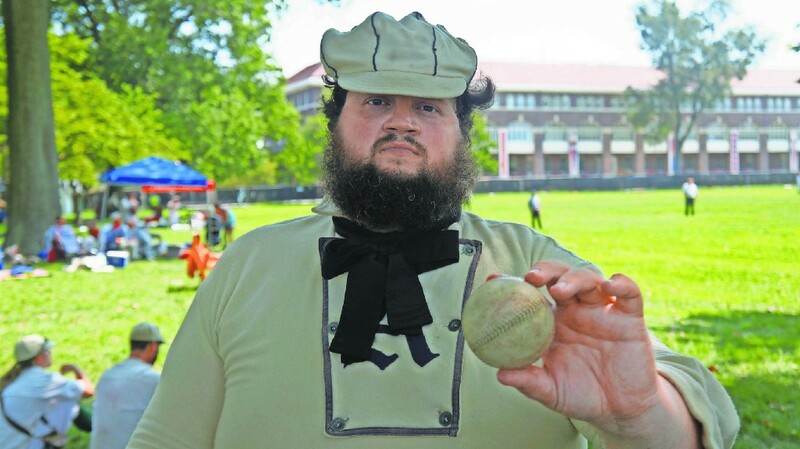 Fans and players of 19th century base ball (spelled as two words back in the day) made their way down to South Philly’s Navy Yard Saturday and Sunday for a 19th century base ball exhibition. The event featured teams from as far north as New York and as far south as Maryland competing in exhibition games. All of the teams compete in a loosely organized league called the Mid-Atlantic Vintage Base Ball League, which has 19 clubs. The first thing you notice about the game is the uniforms. In an effort to replicate the game exactly how it was in the 1860s when baseball was in its infancy, all the players wear authentic wool uniforms, complete with pantaloons and a bow tie. The second thing you notice is the game is played slightly differently. For starters, not every pitch is called either a ball or a strike like modern-day baseball. In the 19th century, pitchers would just keep throwing pitches until a better swung at a ball. However, at the arbiter’s discretion, if it gets to the point where a batter is taking to long to wait for the perfect pitch, the arbiter can only then begin calling balls and strikes. Three strikes and you’re out. Three balls equates to a walk (unlike modern-day baseball, where it takes four balls to walk a batter). Another difference is fair vs. foul balls. In modern baseball, If a batter hits a ball in fair territory and the ball rolls foul before it passes first or third base, the play is ruled dead and the ball is called foul. But in 19th century base ball, this is not the case; if a baseball hits the ground in fair territory on the first bounce after coming off the bat, it’s a fair ball no matter what. If a foul ball is called, any baserunners must hustle back to their bases to avoid being thrown out — another key difference from modern baseball, where runners are immune to tag/force outs on foul balls. Originally, according to Alberts, there were traditionally no fences on baseball fields. But that changed at an 1866 championship game between the Philadelphia Athletics and the Brooklyn Atlantics when an excess of 30,000 people showed up to the game. Typically, spectators would stand in foul territory and the outfield. But this particular game had so many people that they were interfering with the game itself, standing on bases and in the field of play. As a result, the game had to be cancelled just two innings in. From then on, Alberts said, it became increasingly more common to see venues with fencing and seats. Ryan Berley, who co-founded the team with Alberts, is attracted to the sport because he has a keen interest in both baseball and history. “I love history, and so when Scott called me up and said ‘hey we’re kind of interested in this 19th century base ball idea, what do you think?’ I said ‘I’m in,’” he said. Berley said he wanted to get back into playing baseball after having played in Little League up until high school. After he went away to college, he became focused on building a career and baseball fell to the wayside. But this was an opportunity for him to get back into it, even if it wasn’t as competitive as playing high school ball. For more information about the Mid Atlantic Vintage Base Ball League check out its website at mavbbl.com.